Put water, vegetable oil, salt and sugar in a sauce pan and bring it to a boil. Put the flour in a bowl and mix it with yeast. Slowly pour the boiling water over the flour, stirring non-stop until the dough is smooth. Put it in a pot and leave it a warm place to rise. It will be done when the side of the pot is tapped with the finger and a thick, dense sound is emitted. Heat a frying pan. Add the oil. When it boils, take a vessel and cut a hole in the bottom no larger than a finger. Pour the dough into the vessel while covering the hole with a finger. Put the vessel over the frying pan and remove the finger while turning the vessel in circles to form rings or lattices or make a straight line. Take care that the oil does not cool or the batter will stick to the pan. 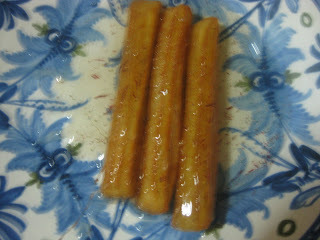 When the churros is golden brown place them on a plate of skimmed spiced honey. If desired color it with the addition juices made from brazilwood, gum lac, madder, saffron, fennel or fox grape. 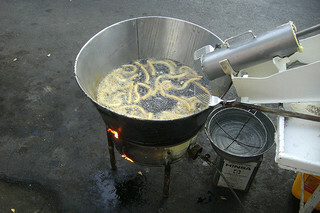 When the churro has absorbed the honey place the them on another dish and sprinkle with cinnamon and sugar. Huici sites this as campechy wood. Perry claims it is Brazilwood and explains that “Brazilwood, Caesalpinia sappan, is not a New World plant but an East Indian dyewood well known in the Middle Ages. When campeachy wood or logwood, Haematoxylon campeachianum, was discovered in what is now Brazil, it was at first called "brazilwood” for its reddish dye called brazilin. “Since it was Brazil's first big export, the country took its name from it. 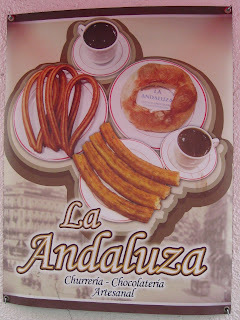 . ."
Chocolate con churros! the most glorious Spanish breakfast or "merienda" ever! 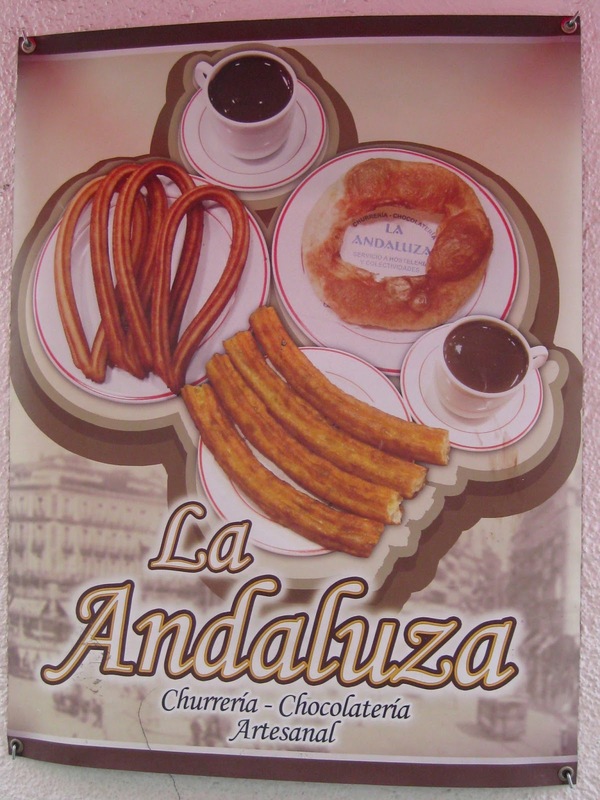 Naturally chocolate entered gloriously into European life only in the XVIIth century and by the XVIII it was an institution in Spain, forming a solid and long-term marriage with churros, and initially winning the battle against coffee and -in the Peninsula definitively- tea. In fact, could you ever put a churro into a cup of tea without ruining both tea and churro? Here density calls density, in a combination that requires no other explanation to novices than: go and try!